My first show at the Village, Belvedere. That's Joe French, Luke Huber, Irene Schweyer Hublick (a.k.a. The First Lady of Greenfield Village Theatre), and me as the nosy next-door neighbor. For more about this show, keep reading. For more photos, scroll down to the end of this post. By “The Village” I mean the Greenfield Village Theatre Company. For decades, it was a fixture of the Detroit area professional theater scene, housed within the walls of the Henry Ford Museum in Dearborn, Michigan. It’s been some years since the company was disbanded. Its founder and Artistic Director Dr. Joseph N. French has moved on to that big dressing room in the sky, where I’m sure he now enjoys observing the angels as they go about their business. I wouldn’t have written this essay while the company existed or while Joe was still alive, but I’m not getting any younger either, and in any case, it’s been over 25 years since most of these events transpired, so there are some things I’d like to set down for the record. I really hate to begin a post with disclaimers, but I’m afraid they’re called for here. I’m going to say good things, but I’m also going to say bad things about shows that some dear friends were a part of, but for the most part, I’m not going to name names. I have no axe to grind with any of you about the Village, so please look upon this as an opinion piece. It isn’t the last word on the subject; it’s merely my word on the subject. The GVTC was almost the site of my professional acting debut. In late 1978 (I believe), I auditioned for their production of The Man Who Came to Dinner. The show was cast and I was not called. This hardly surprised me. I’d never set foot in the theater before. I hadn’t known a soul at the auditions and it had seemed clear that nothing I’d read that night had made an impact on anyone. But several weeks later, I got a phone call from someone at the Village telling me that an actor had dropped out of the cast and would I be interested in playing the role of (I think) a butler. As luck would have it, I’d just been cast in a community theater production of Equus, a show I’d long dreamed of being a part of, so I turned down the Village’s offer. A few months later, I was cast in a show at Detroit’s Attic Theatre and began a lengthy and fruitful association with them, so it was a long time before I again crossed the Village’s threshold. Over the next several years, as I became familiar with Detroit’s theater scene, one fact became clear about the GVTC: It was the object of widespread scorn among much of the acting community. It was not considered “serious”, due perhaps to their propensity for producing old comedic chestnuts that nobody does anymore. Never did one hear of the Village producing shows by edgy modern playwrights like Rabe or Mamet. Even given their taste for older plays, one was far more likely to see a frothy comedy like Nothing But The Truth or a little-seen relic of the past like The Contrast than something by Eugene O’Neill or Samuel Beckett. So, being young and impressionable, and aspiring to the pretentiousness of my more cultured fellow thespians, I avoided the Village for years. In 1986, I heard that the Village was producing the play Belvedere. Never heard of it? I hadn’t either. I later came to realize that it is a remarkably obscure play. 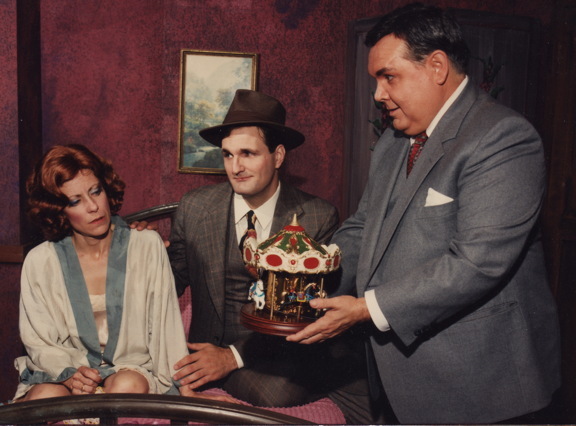 Though it was the inspiration for the 1948 movie Sitting Pretty, as well as the 1980s sitcom Mr. Belvedere, the play seems to have fallen completely out of the public record. IMDB only lists the original novel as the inspiration for the movie and TV show; it makes no mention of the play at all. And I’ve never heard of another production of the play, so this is obscure stuff indeed. So what attracted me to this production? Why was I finally going to set foot in the Greenfield Village theater for the first time since my 1978 audition? Well… my memory fails me, but it’s entirely possible that I was called and asked to audition for it by the play’s director, Mary Bremer. I have enormous respect and affection for Mary, who has long been one of the leading talents in the Michigan theatrical world, so I suspect that’s what got me in the door. Over the next six years – until I moved to Chicago in 1992 – I did a bunch of shows at the Village. I even made my debut as a playwright when Dr. French hired me to write an adaptation of the 1903 musical Babes in Toyland. I could write a few thousand words about that process, but I’ll keep moving. The first thing I noticed about working at the Village was that there was a comfort level to the production process that is virtually unknown among theater companies. At a typical theater, every production has a level of hustle to it – you’re operating on a shoestring or close to it, so you’re constantly concerned with generating sales and publicity, lest a failed show or two should put the company out of business. At the Village, such concerns seemed to be in the background if they existed at all. The theater company was merely a small part of the Greenfield Village/Henry Ford Museum complex. The theater itself, a spacious old proscenium house, was actually within the walls of the museum . This resulted in an odd arrangement for rehearsing. Rehearsals usually took place at night after the museum had closed for the day, so a security guard with a key had to let everyone in and out of the building. In practice, this meant that if you were needed at all on a given night – even if it was to throw in one line in one scene – you had to arrive with everyone else at, say, 7:00 p.m. and you had to stay until the rehearsal was over and everyone else was leaving. Yes it was strange, but nobody stressed about it because it simply came with the territory. Being a part of the Village/Museum complex also came with some unique advantages. Commonly, production staff were able to borrow antique furniture and props from the museum’s collection to use in the shows. Even if you’re not a theater person, I think you can see that this is a perk to die for. Season subscribers surely numbered in the thousands and almost every show was well attended. Dr. French once told me that the theater company’s charter stipulated that, in keeping with the museum’s identity as A) American in focus and B) a museum, all of their shows had to be A) American in origin, and B) At least 35 years old. Part A was the source of an amusing irony. Dr. French had gone to graduate school in England and his PhD was specifically in Shakespeare, but his company could never produce anything written by Shakespeare since the Bard wasn’t an American! It must be said that many productions at the Village exhibited little focused effort at creating a truly excellent product. Good enough was usually good enough. You showed up; you learned your lines; you learned your blocking; and nobody there would push you to engage in any deeper thought about it. The result, all too often, was that you’d end up presenting a pretty little reading of the material without doing any of the work that excellent theater generally requires. Maybe you could blame the built-in audience. Maybe you could blame the scripts. Maybe, as was often alleged, it was Joe French’s fault. Plenty of theories have been tossed about and I’m not sure there’s any one factor that explains it all. But many times, I would see talented directors and actors come to the Village and suddenly do mediocre work; suddenly not do their homework. The excellent work you might see them exhibit at other theaters was curiously absent from their work at the Village. There seemed to be an inexorable pull toward mediocrity. There were, to be sure, exceptions. There were people who brought their A Game every time out regardless of the venue. But as I said earlier, I’m not naming names because if I praise some people, it implies a criticism of the people I didn’t name, so I’m not going to start down that road. But I will name one name: Me. It took me a few shows there to get my footing; to realize that I had to walk in the door with my own standards, because those standards were probably going to be higher than anything that was going to be asked of me. I’ve come to believe that this is a good discipline to develop for any actor in any theater. Hold yourself to a high standard and make damn sure you’re pleased with your own effort. Mr. Marsh only considered shows that played in Dearborn and Dearborn Heights. The GVTC was the only professional company in that area, so it meant that my fellow nominees were actors from area community theater and high school productions. I mean no disrespect to anyone working at such a venue; marvelous work is regularly done at such places. Let me put it this way – I would have felt far more honored had I beaten out other professionals, or at least people from a wider theatrical pool. Does that make me a snob? I don’t think so. But this is how much the award meant to me: The night they called my name, I was in Toledo, Ohio watching a Mud Hens baseball game along with my girlfriend and my brother. We had a great time, by the way. I didn’t actually receive the award certificate until about a year later, when a friend passed it along to me courtesy of Mr. Marsh. 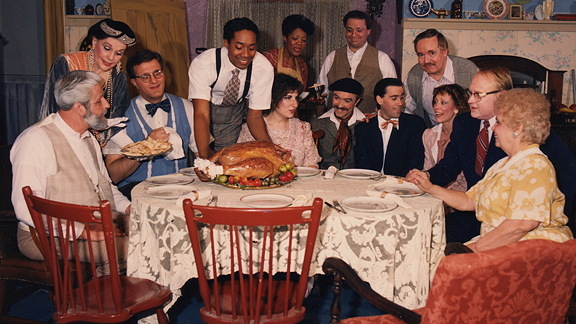 As long as I’m dumping on Richard Marsh, who is no longer here to defend himself, let me pass along this nugget: One of the first shows I did at the Village was a thuddingly inert rendition of You Can’t Take It With You. It’s a fine old script that deserved a better fate. After the curtain had dropped on opening night, I was putting props away in the wings when I noticed that an audience member had come up, parted the curtains, and was poking around on the set. I went out and tactfully informed him that this wasn’t appropriate. He merely smiled, thrust out his right hand to shake mine, and breezily said, “Richard Marsh, Press and Guide” – which meant nothing to me; I wasn’t from Dearborn. I decided he was harmless and let him be. The Rest of the Story came the following week when Marsh’s review appeared. You see, part of our set dressing was an American flag. It wasn’t spread out; it was in a corner upstage standing on an upright pedestal. From the audience, you could only see enough of it to know that it was an American flag. In Marsh’s review, he specifically criticized our set for containing a 50-star flag. Since the play was set in the 1930s, it should have been a 48-star flag. And that’s all very true, but the only reason Richard knew that was because when I approached him on the set, he’d spread out the flag and was counting the stars! So if, a few years later, I was less than dazzled by his award to me, I hope you can understand where I was coming from. One of my favorite Village memories goes back to the first show I did there, Belvedere. One night right before the show started, one of the children in the cast fell ill. He was throwing up backstage and was sent home. Well… he didn’t have that big of a role, so our remedy was to make an announcement to the audience and have our stage manager come out on stage and read in his lines. Our stage manager was a grown man with a beard and mustache, and it was a little strange at first, but the audience quickly accepted it and the show proceeded smoothly. Until intermission. Our director had popped into the theater late in Act I and saw what we were doing, and she felt there was room for improvement. She insisted that our stage manager be clean-shaven so as to be more believable as a little boy, so during intermission, off came the beard and mustache. And so, when he made his first entrance in Act II, there he was suddenly clean-shaven. The audience began snickering, realizing what had happened and why it had been done. I suppose you could say that this was, after all, a comedy so we like it when the audience is laughing, but this sort of laughter… wasn’t quite true to the playwright’s intentions. This moment has since become a touchstone between all of us who were there that night. The worst play I ever saw there? It would have to be the one time I know of when they undertook the work of Arthur Miller. For the sake of discretion, I will omit the name of the play, but it is a well-known and much loved script. Some good actors seemed at a loss to construct a sense of narrative. As for dramatic tension, it was weirdly absent from a play that should squeeze its audience like a vise. The whole thing felt like a cold reading by people who didn’t know the story or what it was about. Whose fault was it? I will not pretend to assign blame. I can only tell you what I saw. Likewise, if I see a dead fish floating in a pond, I may never know whether the cause of death was murder, suicide, disease, boredom, or neglect – but I know a dead fish when I see one. The best play I ever saw there? It was their production of Tennessee Williams’ The Glass Menagerie. I’ve seen a few other renditions of it, including the Steppenwolf’s well-regarded production in the late 1990s, and the Village’s production tops them all. It was one of those productions that reminded me why I go to the theater; why I keep hoping. If the GVTC suffered from inconsistency, it was plain to see that they were hardly alone in that failing. I doubt there has ever been a theater of any longevity that did not produce both excellent and dreadful shows. And yet, there was something different about the Village. Maybe it’s that the gap between their best work and their worst work seemed so wide. Or maybe my uncertainties were centered around the snobbish crowd to whom I referred earlier, who had years before judged and convicted the GVTC of the crime of insignificance. The fact is, I wouldn’t have dreamed of trying to convince them otherwise. I try not to argue over opinions. We often see what we expect to see, and if you’ve already reviewed a play in your head before the curtain goes up, nothing that happens afterward is likely to change your mind. Finally, I must send out a special thank-you to the aforementioned Mary Bremer. It was she who cast me as John P. Wintergreen in the GVTC production of Of Thee I Sing. It was the one time in my life when everything lined up for me to play the romantic lead in a musical. It took place at a time when I was the thinnest I’ve been in my adult life (people would ask me how I’d done it and I’d tell them the truth: Poor diet and excessive worrying). It was also the right role at the right time in my life – but it still only happened because Mary saw me in the role. Part of me knew that it was fated to be a rare opportunity, so I think I enjoyed it more than someone who spends their career playing such roles. The one scary aspect of playing that role in Of Thee I Sing was that it meant I would have to dance the spotlight dance in the last scene of the show. Anyone who knows me should know that I am a spectacularly bad dancer. So at the first rehearsal, I took my leading lady aside and asked her to agree to something. As soon as our dance was choreographed, could we agree to always find time to go out into a hallway and run through it at every rehearsal – even if it wasn’t a dance rehearsal? And could we also run it before every show? Luckily, she turned out to be just as insecure about her dancing ability as I was about mine, so she agreed. My final triumph came on the night CC saw the show. She knows my dancing limitations better than most. After the show, she delivered her critique: “Let me put it this way – You managed to get through the entire show without the audience finding out you can’t dance.” I couldn’t have been happier. Mission accomplished. Nowadays, the GVTC is gone; Joe is gone; and for that matter, I’m gone, having moved to Chicago in 1992. The passage of time has served to underline what a rare and special theater the Village had. Some of the people who had ill feelings towards the place in the 1980s and 90s probably feel the same way today, not only over their aesthetic perceptions of the place, but also over the unsuccessful attempts made by the Actors Equity Association to have a dialogue with the Village about its non-union status. That’s a battle I was at times caught in the middle of, but I won’t launch into an in-depth discussion of it; it was insoluble 25 years ago and it’s definitively insoluble now. The highest compliment I can pay to the GVTC is that it was a part of my education. I found things and people that I loved, and other things and people that, well, I didn’t love. I learned things about myself and my craft that I might not have learned anywhere else. And I had fun. Please don’t leave fun out of the equation. The GVTC was a gift that turned up smack in the middle of my road through life. Instead of going around it, I went through it and assimilated what it had to offer. Those elements are still a part of my life. I worked with these lovely people in You Can’t Take It With You. For this role, I had to learn how to play the xylophone badly, at which I was a natural. 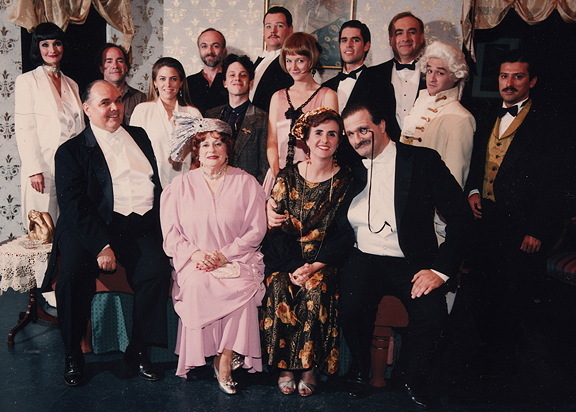 These handsome folks and me comprised the cast of The Solid Gold Cadillac. My role as a weaselly office toady came to me all too easily. 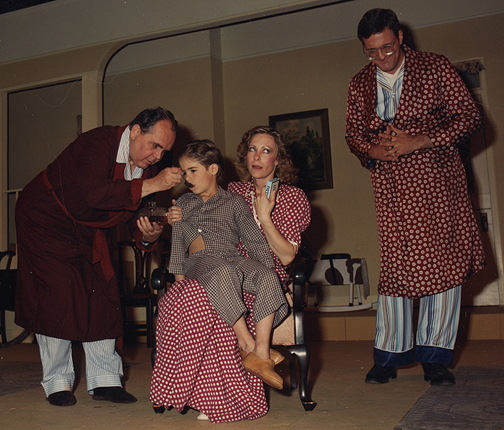 Playing Tom in The Time of Your Life was my favorite role that I got to play at the Village. This production was an honorable and heartfelt rendition of the show. As in Belvedere, I was once again accompanied by Irene Schweyer Hublick and Joe French, who wore his best toupee for the occasion. The cast of So This Is London, the last show I did at the Village. 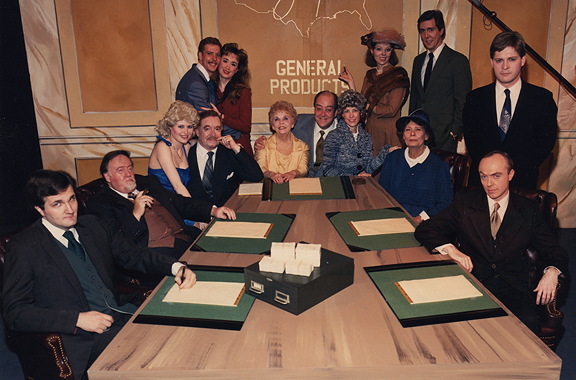 A few non-cast members may also be seen here, including the late Tom Farrar, David DuChene, our director Harry Wetzel and the invaluable Elaine Kaiser. This show was a fine way to close out my time at the Village. Interestingly, there is a type of random theater that currently happens at Greenfield Village. You may recall that they have the Wright Cyclery. Nearby is the Wright brothers home. On a visit last year, I observed the Wright brothers engage in dialogue with their family after their triumphant return from their first flight. I assume these exhibitions happen with regularity, as there is a small seating area in front of the house. Yes, such performances have long been a part of Greenfield Village. Back in about 1988, I was hired to do a show in the Village. It was the Christmas show at the Eagle Tavern. A group of us who were all regulars at the theater were tasked with putting together a show. We decided to present ourselves as a traveling theatrical troupe. Each of us came up with our own character name and description and we would spend a few hours going from table to table, singing old songs, telling old jokes, and engaging in general tomfoolery. In other words, I was paid to do what I've spent my life doing free of charge. As a professional costume designer, I must admit that my work was lowered to mediocrity due to the cost of living. Dr. French's payment method for my services was to give me a lump sum and any funds left over after purchasing what was needed to clothe the actors could go into my pocket. The amounts were so small that the costumes, and so the overall productions, suffered greatly. Linda Hill was much better at stretching those meager dollars than I. My custom made period hat goes off to her as I hang my head in shame.